MICRO KIDS – HAWK ON TV! In France, we had a TV show talking about video games. In the late 1991, the show also displaid demos at the end of emission, in end generic. Each week a different demo. I sent our demo « Earth’s sorrows » and we’ve been selected. Our demo was shown at the end of one TV show. They choose to show the 3D part (which was the most impressive, I understand, but not a part I’ve programmed). 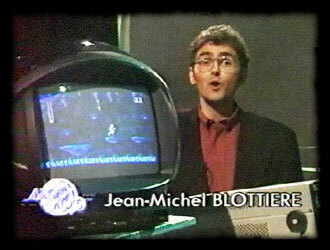 The presenter was Jean michel blottière which was famous for leading TILT the first and best magazine on video game in France. I did not find the emission where our demo have been shown, but I’m still looking at it.